This Unit focuses on transport systems in animals (respiratory, circulatory, digestive and excretory) and plants (roots, stems-xylem and phloem, leaves) and addresses the California Science Standards for 5th grade Life Science. By the end of the unit students will know the main idea that structure and function are related in living organisms. Specifically students will know that: living things are organized structurally from microscopic cells to tissues, organs, and organ systems; within each of these levels, living things demonstrate a structure function relationship in which the way something is designed and built contributes to its ability to perform specific functions; four systems in animals function to transport materials; those systems are the respiratory, circulatory, digestive and excretory systems; each of these systems is made of smaller parts called organs, each with their own function; in addition to a specific function (e.g., digest food), these systems are inter-related (e.g., circulatory and respiratory) to provide nutrients to the body and remove wastes; plant structures also provide transport of nutrients and the removal of waste; roots, stems (xylem and phloem), and leaves are actively involved in the transport; photosynthesis enables plants to make food from carbon dioxide and water in the presence of chlorophyll and sunlight; photosynthesis produces oxygen, which is used by animals and plants in the process of cellular respiration; cellular respiration produces carbon dioxide used by plants creating the photosynthesis/respiration cycle. The Grade 5 Life Science Unit is presented to students through a series of investigations, experiments, active learning experiences, questions, and assessments. Assessments include: pre-, post- and 6 formative assessments. 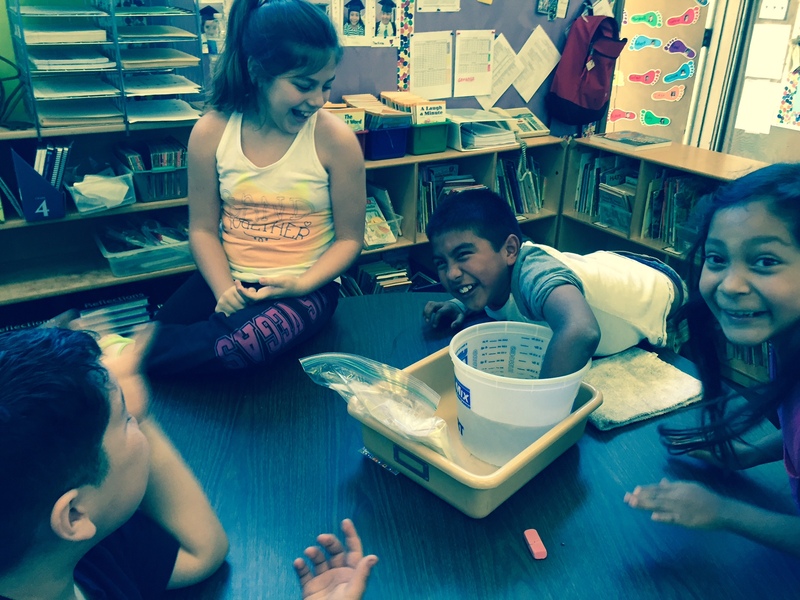 This Unit focuses on matter and its properties. All of the Grade 5 California Science Content Standards for Physical Science are addressed in this unit. By the end of the unit students will know: elements and their combinations account for all the varied types of matter in the world, all matter is made of atoms, which may combine to form molecules, each element is made of one kind of atom and that the elements are organized in the periodic table by their chemical properties, differences in chemical and physical properties of substances are used to separate mixtures and identify compounds, and changes in matter are due to heating, cooling, and mixing. The Grade 5 Physical Science Unit is presented to students through a series of investigations, experiments, active learning experiences, questions, and assessments. The Grade 5 Earth Science Unit focuses on the uniqueness of Earth through several of its systems (water cycle and weather) and addresses the California Science Standards for 5th grade Life Science. By the end of the unit students will know the main idea that as the “water planet” Earth is unique. structure and function are related in living organisms. Specifically students will know that: the solar system consists of the sun (a star) and 8 planets; that each planet has its characteristics (including size and distance from the sun) by which it can be described, and that the Earth is the only one with water. Students will also know that water on the Earth allows for life to exist; that the water cycles through living and non living components of the environment; that water cycles as individual molecules and at different rate and from different locations; that the water cycle is a major basis of weather which is the condition of the air around us. Students will know the relationship between density, temperature, relative humidity and air pressure and how those factors impact local weather as well as contributing to severe weather patterns. Throughout the unit, students collect data on weather from their weather station. They analyze the data and make predictions about future weather patterns in their local area. The Grade 5 Earth Science Unit is presented to students through a series of investigations, experiments, active learning experiences, questions, and assessments. Assessments include: pre-, post- and 3 formative assessments. Hello my name is Michelle Carpenter and I’m a teacher in Lompoc, California. I am interested in your next Science workshop for teachers. Thanks for the lesson plans. Thank you for your interest in Science Matters. At this time, we have not scheduled another teacher workshop. Please visit the Science Matters website later in the school year for additional dates for teacher workshops. I just came across this amazing resource– it’s going to be so helpful– we have old, incredibly dry textbooks at my school and almost no other science resources, so I’ve been looking for alternatives! Do you typically teach all of one major branch of science at a time (e.g., all of the life sciences standards, then all of the earth science standards, etc.) or do you mix and match? What order do you recommend? Thanks! I can’t tell you how much my students and I enjoy these fun, creative, information-packed, easily adaptable lessons. We learn SO much and new things each time. Lisa on What is Science Matters? Grace Dankyau on What is Science Matters?